The deal was sealed when Austral­ian Prime Minister Scott Morrison and his Fijian counterpart Voreqe Bainimarama reaffirming the friendship between the countries in Suva last month. Vicki Wilson can now work with a peace of mind as she prepares the squad for the Netball World Cup in Liverpool, England. The Fijian Pearls coach seems to tick the right boxes building up to the July 12-21 four-yearly event. She got the depth in the squad ad­mitting she would have ‘great head­ache’ when she selects the final 12 players in June. And to top it all, the Fiji Netball Association will receive a financial boost from Australia as part of the Pacific Sports Partnership. 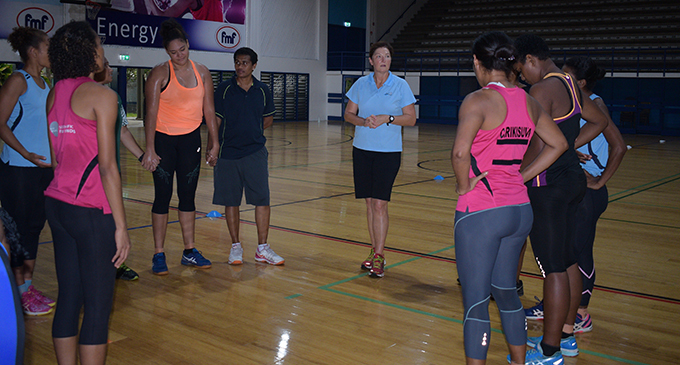 The Pacific Sports Partnership, Australia’s flagship sport for devel­opment programme in the Pacific, will see Fiji Netball receiving finan­cial support to help them prepare for the Netball World Cup. The funding will enable Wilson to hire additional staff to assist at a series of training camps and up­coming friendly matches against Singapore, New Zealand and Sa­moa. Fijian Pearls side at the FMF gymnasium on February 7,2019. Committees (FASANOC) as the strength & conditioning coach. “It means, first and foremost, that we will be able to engage the servic­es of support staff such as a perfor­mance analyst,” Wilson told Radio New Zealand. “It’s really important that we work with a performance analyst to be able to not only analyse our per­formance…but also the opposition. “It’s a really steep learning curve for the girls to be able to do that. “But it’s also an amazing resource to have at your fingertips so our support services, such as the per­formance analyst, a mental skills coach, medical services- being able to take a doctor with us on tour. This is a total step-up from the Fi­jian Pearls preparation for the 2018 Commonwealth Games, where Fiji Netball had invested $180,000 in their team’s preparation. Taking a young team Wilson copped a lot of flak when Fiji did not win a game at the Gold Coast, finishing bottom of their group. But the World Cup is the pinnacle event and competition would be in a total new dimension.